China's Electronics Industry is a comprehensive and current report on the technologies, manufacturing capabilities, and infrastructure that have made China a major player in the electronics industry. Not only does it cover the past, present, and future of important electronic technologies, but also the pros and cons of conducting business in China. This is an important reference for any company planning a venture in China as well as those who have already taken their first steps. It will also be of great interest to researchers and policy makers who need to know more about the role of central government in promoting strategic industries and assisting national science and technology development. Much of the data contained in the report is from 2006. No country has burst onto the economic scene as dramatically as China has in the past decade. It is the world's largest producer of many electronic products and has a leading edge semiconductor industry. This timely and comprehensive report from America's leading authority is a critical for anyone who is interested in working with China in the electronics field including business managers, academics, government institutes, foreign investors, as well as those who are interested in the past, present and future growth of China's Electronics Industry. 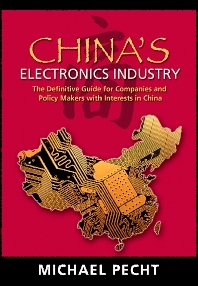 If you are thinking about doing business in china's electronics industry, you must have this book. An essential guide for anyone thinking of moving or outsourcing their electronics business to China. Excellent reference for policy makers interested in the factors contributing to the success of China's electronics industry.